The East Bay Area is a vibrant hub for commerce, and Concord is no exception. With a wide variety of both local and big name companies, competition is common. Business signs are a great opportunity to set yourself apart from your competitors, and are so important for attracting attention and creating a great first impression for potential customers. Sequoia Signs & Graphics can help you create the perfect custom built sign for your Concord, California based company. 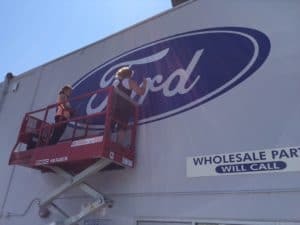 Here’s our team installing a sign at Future Ford located in Concord, California. As a local full service company, Sequoia Signs & Graphics helps clients through the entire creation process, ensuring unique and reliable work. We offer a wide variety of sign products designed to meet the needs of the local businesses including indoor signs, outdoor signs, banners, vehicle wraps, office signs, window graphics, channel letters, monument signs and so much more. There are several popular shopping centers located throughout Concord, such as the Willows Shopping Center and Todos Santos Plaza. Places like this provide a high volume of street and sidewalk traffic, and the right business sign is a great way to attract these potential customers. We specialize in creating high quality custom outdoor signs that are built to withstand the sunlight, wind and rain that can damage these signs. We also offer outdoor signage for a variety of purposes, including movable sidewalk signs, vinyl banners and illuminated signs. Sun Valley Mall was once considered one of the 50 largest shopping centers in the country, and it still offers over 100 stores and services. In locations like this where competition is high, a great indoor sign is needed to stand out from all the other stores. They are also invaluable inside office spaces. If your office has a waiting room, conference room or reception area, this is a great opportunity to brand your space with a sign or logo. At Sequoia Signs & Graphics, we can help with all of your signage needs. We offer a diverse selection of indoor sign options, including ADA signs, directional signs, lobby signs, window lettering, and many more. Having a great, unique business sign can take your company to the next level. We offer free quotes and fast turnarounds to help meet your budget and deadline needs throughout Contra Costa County and the surrounding areas. Contact Sequoia Signs & Graphics by calling (925) 300-1066 or emailing info@sequoiasigns.com to get started on your custom signage project today.